Around 25% of the world’s urban population lives in informal settlements, areas that are cut off from basic services and city infrastructure. Mapping these locations can dramatically help aid and non-government organizations better serve those in need. To help, researchers from several universities developed a deep learning-based tool that can automatically classify informal settlements using freely available satellite and aerial imagery. Using eight NVIDIA Tesla V100 GPUs with 16GB of memory each, the team trained a convolutional neural network on very high resolution (VHR), high resolution (HR), and low resolution (LR) satellite imagery. Since attaining (VHR) satellite imagery can be expensive the team also developed a cost-effective method that uses low-resolution satellite imagery. The major contributions of the work are the public release of the two-deep learning-based systems with their corresponding source code and models. The datasets have also been made publicly available highlighting areas in Colombia, India, Kenya, Nigeria South Africa, and Sudan. “As part of this work we fused several data sets together, to generate usable data sets that can be used by the community for developing new machine learning models,” the researchers said. Predictions of informal settlements (white pixels) in Kibera, Nairobi. 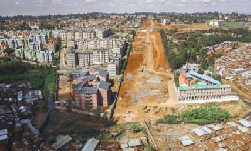 Left: The CCF prediction of informal settlements in Kibera on low-resolution Sentinel-2 spectral imagery. Middle: Deep learning based prediction of informal settlements in Kibera, trained on VHR imagery. Right: The ground truth informal settlement mask for Kibera. The methods are trained to classify what the spectrum of an informal settlement looks like. Using freely available low-resolution satellite imagery the team trained the system to detect everything that is and is not an informal settlement. The second method uses semantic segmentation to analyze very high-resolution satellite imagery, which is helpful in locating settlements that do not contain unique spectral data on low-resolution systems. The work was performed by a group of researchers from the University of Oxford, DFKI, TU Kaiserslautern, King’s College of London, and others during the Frontier Development Lab Europe program. 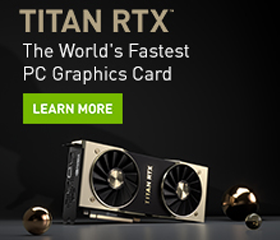 NVIDIA donated the computation resources for this project. The source code and models are available on GitHub. A paper describing the methods was recently published on ArXiv.